The organizers of MAST Asia didn’t mince words. Billed as “Japan’s first ever international defense event,” the three-day conference and exhibition in scenic Yokohama brought together Japan’s armed forces and representatives from several Western navies. Also participating was the Defence Technology Foundation, a think tank for Japan’s peaceful military. Unmentioned yet critical to this year’s MAST Asia was its purpose. This was to foster cooperation in the loose-knit alliance coalescing against China. But MAST Asia, a.k.a. MASTconfex, which took place from May 13 to 15, was all about naval technology. For good reason: Yokohama is the capital of Japan’s naval ship building and hosts two major bases. In 2013 the helicopter carrier Izumo was launched from a local shipyard owned by IHI Marine United. The Izumo commissioning was in March, 2015. The first day of MAST was mostly occupied by the Future Submarine Forum featuring “top level commentary from naval operators.” Speakers included officers from the US Navy and the Japanese Maritime Self Defense Force (JSMDF) as well as guests from Germany and Sweden. The second day of the event involved a long series of discussions about R&D for surface and undersea vessels, i.e. warships and submarines. Fun was also on the agenda. Visitors could participate in a raffle to win an iPad 2 and from 7PM onward the “Annual MAST Party” was held, treating guests to a buffet dinner with optional karaoke. The third and last day of MAST concluded with a press conference. Its message, delivered by government officials, was that Japan is on the verge of joining the global arms trade. This is a role Japan never performed, especially in the last 70 years. 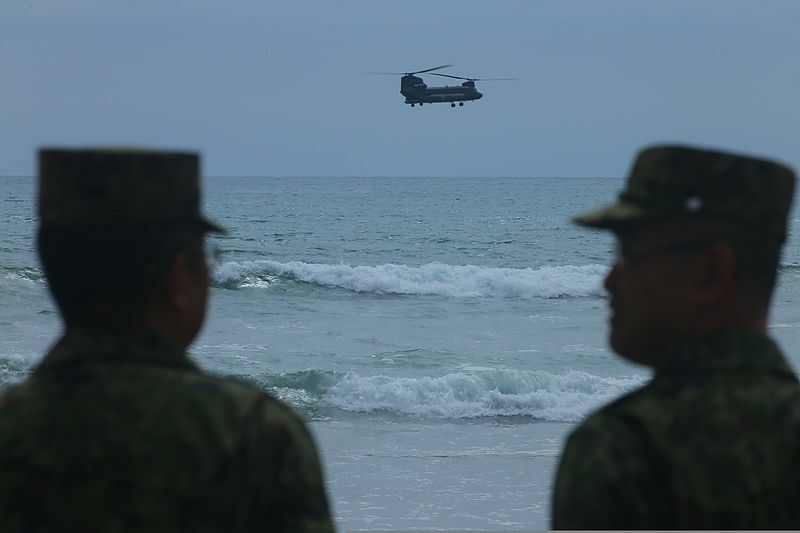 There is little evidence Japan is militarizing but in the last few years the Ministry of Defence (MoD) along with the Self Defense Forces have begun pursuing new capabilities for protecting the country’s airspace and maritime periphery. The most obvious reason for this is the threat posed by Chinese territorial expansion involving disputed small islands. Japan’s MoD has so far been consistent, with acquisitions focused on systems, ships, and aircraft suited for patrol and deterrence.